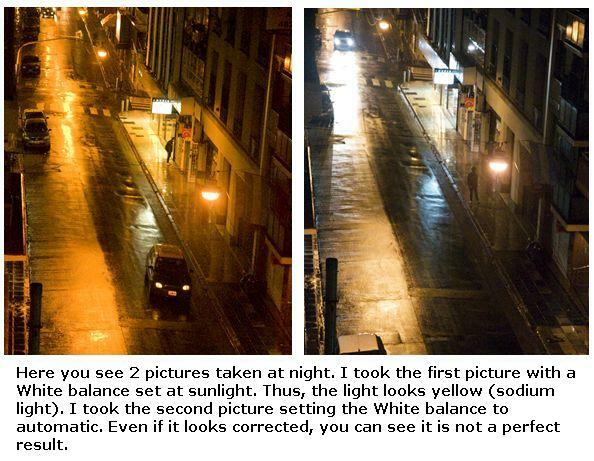 Personally, I never use the automatic White Balance. It doesn't always render good results. I also like to have complete control upon the result of the photograph. Whenever I'm taking pictures, I use customized White Balance. It is the most accurate way to control the colour temperature of light and achieve the expected results. We need to access the menu and select White Balance. In it, you will find all the options the camera has to offer. If it has customized balance, it generally appears at the end of the menu. We select this option by clicking "OK". Then, what we need to do is place a cardboard or anything white in the scene we will photograph. It needs to be illuminated in the same manner as the scene we want to photograph. We get close to the cardboard with the camera until we are only able to see the cardboard in our viewing window. We need to avoid casting a shadow on the cardboard. Then, we take a picture of the cardboard. Actually, every camera is different; in some cameras, we don't need to take the picture. Sometimes, we just need to press the shutter, sometimes we need to press the menu button, etc. We need to read the instructions of the camera to learn how to use customized balance. What the camera will do is take the picture of the white cardboard and make it white in the photograph, regardless of which colour of light is illuminating it. Basically, it adds filters digitally to convert the cardboard into white. Then, we remove the cardboard and we begin taking pictures. The colours in the scene will come out exactly as they really are because, if we corrected white, we corrected every other colour as well. 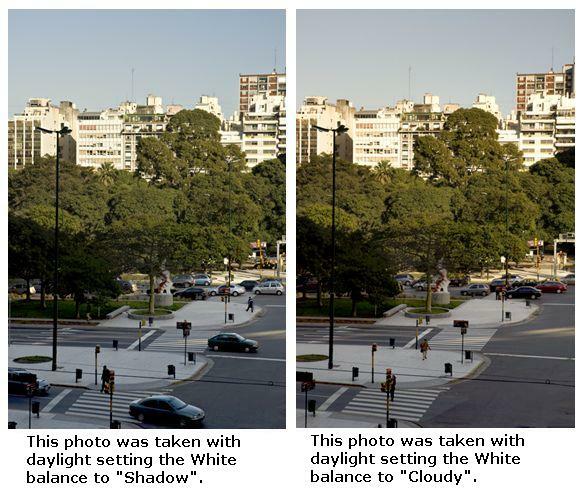 Why is this the most accurate way of using White Balance? Because not every part of the scene we will photograph is illuminated with one type of light. For example, we can shoot photographs inside a room illuminated by tungsten lights, but at the same time, it has a window which allows daylight to come in. Then, this room is illuminated by 2 different sources of light: white light (daylight) and yellow light (tungsten lamps). Customized White Balance will allow us to correct light to achieve the best possible picture. As we mentioned before, not every compact camera has the option of customized White Balance. If your camera doesn't have it, it does not mean you won't be able to take great pictures. I recommend for you to test your camera (its options) to achieve the colour you want. 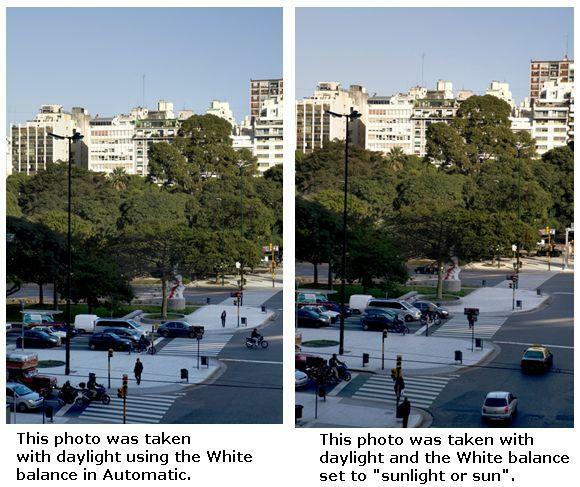 For example, if you are taking pictures with daylight in a sunny day, you can first try ‘’Automatic’’; then, ‘’daylight’’; and then, maybe ‘’shade’’. This way, you will have 3 different pictures under different settings with a slight change in colour temperature. You need to observe you results carefully and choose the setting you like best for the results you want to achieve. In the pictures you see below, you can see the differences when using different White Balance settings. They are not huge differences, but notice how the picture becomes warmer as we change the balance. One picture is not necessarily better than the other one; it is simply a matter of which is the best option for the type of picture being taken at the moment. It is also a matter of taste and personal touch. I believe that despite the fact that digital cameras do practically everything on their own (in regards to White Balance), it is important to understand and know what colour temperature is and how to correct and change it. Why? Because we never know what light conditions we will face when shooting photographs and by understanding what happens in the camera, we will achieve better and more consistent pictures.